Barometers have been used in one form or another for many hundreds of years being, in simplistic terms, an instrument to measure the weight of the air. It was only in the seventeenth century, when scientists were able to show that air weight was directly linked to variations in weather, that it became a domestic appliance. 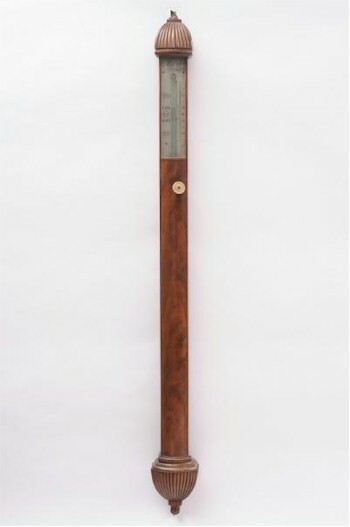 A Mahogany Stick Barometer (FS16/671) made by Adie and Son of Edinburgh fetched £7,800 at a barometer auction at our Salerooms in Exeter in October 2012. The first barometers were of the stick variety with a visible cistern of mercury at the base, which travelled up or down a glass tube as the atmosphere changed showing the likely changes in weather on an engraved scale. The early barometers had cases that mirrored the designs of the day, and we see walnut barometer cases with barley twist columns and herring-bone crossbanding, being very much in the Queen Anne style, by such makers as John Patrick and Isaac Robelou of London. Within a few years the case designs themselves became ever more elaborate, with cistern covers now employed as decoration - wonderful examples being made by, amongst others, John Patrick of Falkirk. By the 1770s, the household stick barometer was supplied with a silvered vernier gauge, divided into decimals of an inch, allowing for greater accuracy when reading the barometer itself. At this point the barometer tube started to be housed within the case of the barometer, rather than the outside, as there was less need to gauge the complete rise and fall of the mercury. This allowed cabinet makers to design far more elegant pieces and so the bow-fronted stick barometer was born, a style used by many of the top barometer makers of the period including George Adams and Watkins & Hill, both of London. The additional area on the case allowed for the application of a thermometer, which gave a more complete weather instrument. A Profusely Carved Oak Barometer (FS17/762) made by T&H Doublet realised £1,400 in our January 2013 Fine Art Auction. As the century came to a close, a new style of barometer was coming into the production - the wheel barometer. Still with a mercury tube, but which now moved a glass float up or down which then turned a hand, via a small wheel, to show the degrees on a round, silvered front dial. The dials were usually of eight-inch diameter although both ten or twelve-inch were utilised, they were at first housed in high-quality, but fairly plain cases. The Sheraton period soon ushered in a period of inlaid decoration to the cases in the form of the diametric and shell pattern although the earlier examples of these wheel barometers had very little other embellishment, usually just the barometer dial itself and then later a thermometer set to the case front. 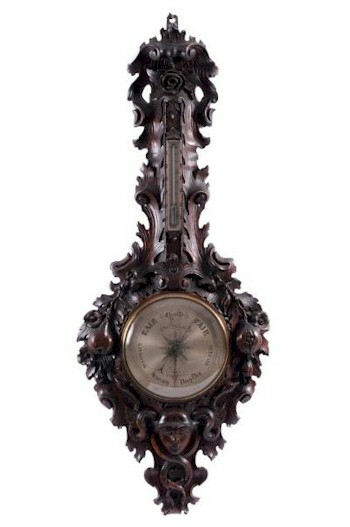 The Italian influence on barometer making was beginning to show itself as the Italian emigrants came to England to better their business; makers such as Roncetti and Somlavico. This is often shown in the way the English makers re-fashioned their names to suit, with the addition of an 'i', 'e' or 'o' on the end of the English name. As the Victorian period progressed, so wheel barometer fashion changed, with the elegance of the earlier cases giving way to the practical as more dials were added. From the original style of just the barometer dial itself, through the addition of a thermometer, then a hygrometer, and then a level to the base, until finally we get the five-dial barometer, with a convex "butler's mirror" set above the dial. This was to be the basic final form of the mercury wheel barometer until the Edwardian period, which saw the advent of the round-dialled aneroid barometer, one that needed less care and was far more portable.